What is a better proof for good music than great acclaims by many websites. It's easy to find his music and it's easier to like it. 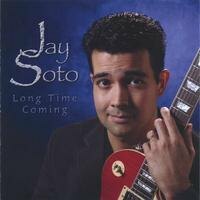 Jay Soto's debut album "Long Time Coming" is an excellent visiting-card showcasing the multifarious styles of this high-talented guitarist. Recorded at SotoPop Studios "St. Helen's in Glendale, produced by Jay himself, he has written all songs except the last tune. He also arranged all tunes, played guitars, keyboards and drum programming. Normally I would expect that such a record would be suffering from a lack of inputs of other artists. Far off the mark! Jay's music sounds fresh and creative. Jay Soto's compositional power shines in the first tune Live It Up. He run the scales of his guitar up and down like a young god. Michael Lington adds some sax flavor. Jay postulates a nearness to Peter White, George Benson and Lee Ritenour and indeed one remarks his prowess soon. Caught In A Moment has romantic moments but Jay's guitar play is so brilliant that one forgets the melody and pays attention to his interpretation. Long Time Coming is the third intriguing tune in a row. Bryne Donaldson is accompanying Jay on saxophone. That his creative impulse needed so long to embody in an album is obviously reason for this title. Jay was also the lead guitarist for Zum Zum Zum, a highly acclaimed Latin group based out of Phoenix, Arizona. Soto's involvement with the group taught him the finer points about Latin rhythms, which he now incorporates into his playing and technique. A wonderful example is Song For Mary-Cruz. Near to classical flamenco music Jay involves his personal attitude. Jesse McGuire's muted trumpet, Rea Herrera's background vocals and Jay Soto on keys are a nice treatment on Reflections but Jay's guitar moves this tune definitely to a higher ground. Celestial. The clear guitar sound on Never Let You Go reminds me at music of Craig Chaquico but we have to visualize that Jay also plays all other instruments like drum programming and keyboards. That makes this musician so admirable. Romantic moods are to find on Remember The Night. Michael Lington's sax creates a warm and sensitive atmosphere. Miss My Cabana has some Latin and Caribbean influences. A positive and life-affirming attitude full of energy and joy. Closer To You (previous title Let's Get Closer) is featuring Jesse McGuire on muted trumpet. Jesse McGuire joined Tower of Power as lead trumpet in February of 1998 and performed with the band for a 2-year stint. He recorded with the band on its Live CD, "Soul Vaccination," in 1999. An awesome tune with great emotions. The only cover on this tune is the final Black Orpheus. A classical tune. Antonio Carlos Jobim and Luiz Bonfá cultivated a delicate, precise classical guitar style with the typical Samba flavor. Bonfá composed this tune for the movie "Black Orpheus" (1959). The title of the original tune is "Manha de Carnaval". Jobim provided part of the score of the film music. Jay Soto interprets the original in his own way adorned with many flourishes. Jay Soto's debut album "Long Time Coming is his pavestone of virtuosity for a hopefully not so long way to musical celebrity.